Please note that A-M Systems instruments are not approved for use with human subjects in either a clinical or research environment. 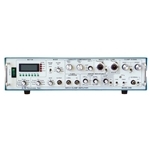 The Model 2400 is a low-noise, full-featured intracellular/extracellular amplifier designed for voltage clamping using patch electrodes on single channels or whole cells. 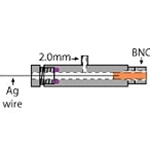 Its unique design allows fast intracellular current clamp measurements with sharp electrodes. Advanced circuit design techniques using field programmable gate arrays eliminated noisy microprocessors. True Current Clamp is 100% stable with bandwidth of 200kHz. Amplifier current gain is extremely flexible as it can accept any of four resistive feedback probes. 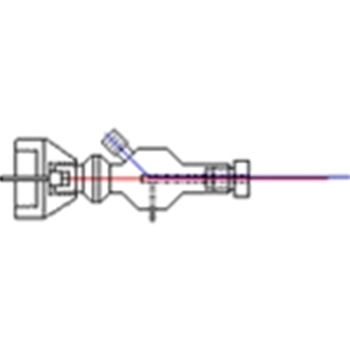 Each probe has two feedback resistors selected from the following values: 10 MΩ, 50 MΩ, 100 MΩ, 1 GΩ, 5 GΩ, and 10 GΩ. The wide range of feedback resistors means currents can be recorded with outputs of 1 mV/nA to 10 mV/fA. The standard probe sent with each unit is the 100 MΩ/10 GΩ version, but other values can be selected. Unlike other patch clamp amplifiers, the Model 2400 has a voltage follower in the probe. This allows this amplifier to be a true fast current clamp amplifier with no instability. An integrated four pole low pass Bessel filter provides flexible signal conditioning. Fine tuning capacity compensation is available to eliminate virtually all electrode-induced transients. Calibrated whole cell compensation provide easy display of membrane capacitance and access resistance. A host of command potentials are integrated internally within the model 2400, including an automatic tracking command to zero the membrane current, manual controls for offset and holding potentials, and an easily readable digital display. For signals that are more complicated, an external command input with different scaling factors is available for use with any signal source. A digital meter provides accurate values of command signals and membrane currents or voltages, the true RMS noise of the amplifier and experimental setup, the cut off frequency of the low pass filter, and the overall gain of the amplifier plus probe. Series resistance compensation provides the researcher with the option of introducing either or both predictive and corrective compensation from zero to 100%. Fine and coarse controls for lag provide sensitive control to minimize oscillation produced by compensation close to 100%. Separate compensation controls exist for eliminating transients seen during current clamp experiments when the bridge balance is used. Telegraph outputs provide analog voltage equivalents of front panel settings including error conditions, amplifier mode and gain, Cmembrane, RMS noise, and low pass filter cut-off value. These telegraphs allow the Model 2400’s front panel settings to be automatically recorded by your system software. For those who need extra large bandwidths, the raw bandwidth of the entire amplifier may be adjusted via a rear panel potentiometer. A second powered probe input is available for use as a bath signal input.